"I teach people to have a relationship with water that works for them rather than against them." This is Fiona Laughlin's guiding principle for teaching swimming to swimmers and triathletes of all age and ability level. Besides Terry Laughlin, Fiona Laughlin, Terry's daughter, is the longest running Total Immersion coach. She is one of a small group of TI Senior Directors, the highest level of TI certification. Fiona started swimming competitively on U.S.S. age group teams at 9 years old, and continued her competitive swimming career through high school and college. She assisted her father at the very first T.I. camp at Colgate University in 1989 at the age of 14, and is now one of only a small group T.I. senior coaches and Directors worldwide. Over the past 16 years Fiona has coached swimmers of all ability levels and backgrounds: college swimmers, triathletes, age groupers, novice, children, and fitness swimmers, at T.I. camps, college teams, Masters and triathlon teams. In 2002 Fiona took up the practice and study of yoga, and now aims to teach swimming with the more eastern mentality of a yoga or tai chi teacher, with a mindful practice aimed at achieving a flow state in the water, in a way that is applicable to any and all swimmers from novice to elite. 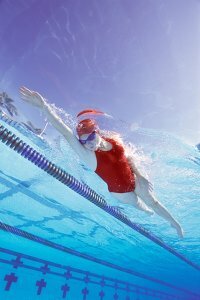 In addition to directing Total Immersion weekend workshops, she can also set up private TI workshops for a group of swimmers, including everything taught in the TI weekend workshops upon request. Fiona is also a TI teacher trainer and has been involved in training many of the TI coaches and other TI teacher trainers who exist in the world today. Follow me on Twitter for TI updates! !